Other: Descendant of a long line of talking rats. ​His mother, however, was of the non-speaking variety. Origin: Anscestor from the world of Ansuz (an-sooze). The world of prophesy, communication and signs. “Aye, how rude of me,” the rat said. He jumped off of Gabriel’s shoulder onto a nearby stack of boxes. 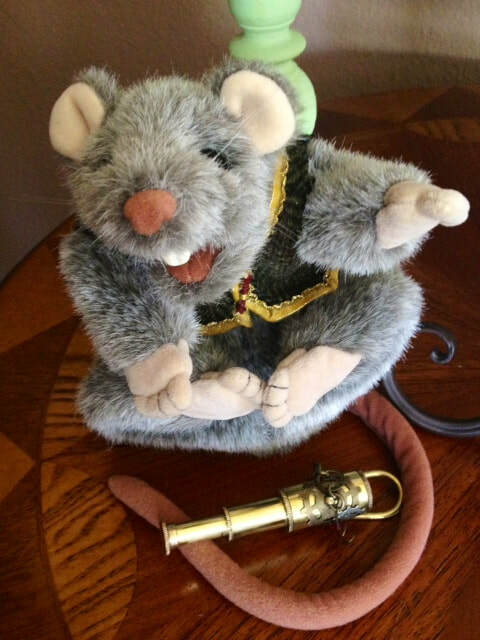 “Xavier Baldric, castle rat extraordinaire. At’ya service,” he bowed deeply. ​Xavier gasped and bowed reverently, his tail curled up toward the sky. Xavier scurried through the forest. He kept one eye on the well-worn path and the other eye looked for the carnivores that lived in this land. He was excited and in a hurry to tell his brothers, sisters and cousins that humans had arrived in Fehu. Xavier had never seen a human. He had only seen them in the paintings that hung in the castle. Today he saw five of them, in the flesh, and a fairy. As he ran he thought about the last time humans lived in the castle. When Kyla, the last guardian, left Fehu she took the creatures that were not indigenous to this world with her, or she sent them back to their home world. It was a history lesson that all rats heard and was passed down from father to son or mother to daughter. When Kyla was gathering up the creatures, Xavier's father asked to stay. He, and some of his kind, had taken the non-talking rats of this world as spouses and had families that they could not leave behind. "Why not take them with you. Back to the world of Ansuz?" Kyla asked. "I cannot subject them to a world of talking animals. They would feel inferior. It is best they stay here where they are accepted and loved." Xavier could hear his fathers reply echo in his mind like it was yesterday. He wondered what would have happened to the non-speaking rats in Ansuz. Would they have been teased? Treated differently? Or would the creatures of that world have accepted them as one of their own? He hoped the humans were friendly and he could ask them their thoughts on the matter. In the meantime he needed to warn his family to be cautious. He would go back and make contact but until then he wanted his family to hide. Current price is $29.99. This is a custom order item as the vest is handmade and matches the description in the book (down to the gold trim and wooden button).